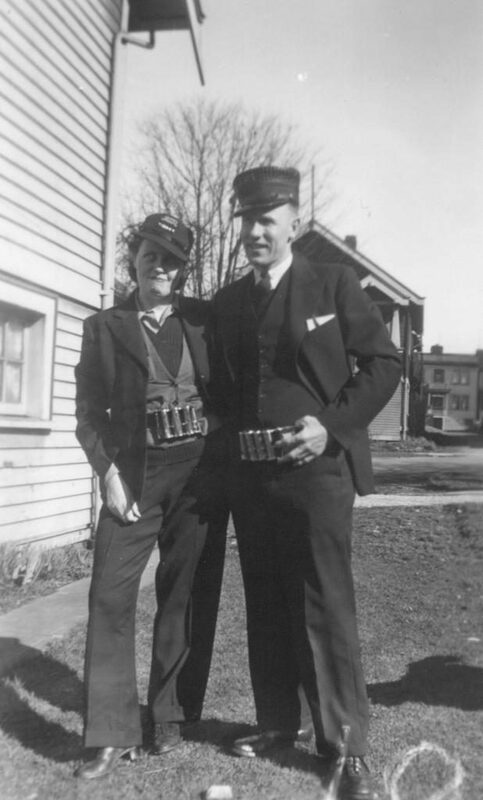 Lyle and Agnes Wicks in circa 1945 wearing their BC Electric conductors’ uniforms. They both worked for the utility on its Vancouver streetcars. Lyle Wicks was born in Calgary, Alberta, in November of 1912 to Claxton and Mary Wicks (nee McConachie). Claxton had come from Essex, England, and Mary was a native of Argyle, Scotland. Lyle was their only child. Claxton died in 1951. Lyle battled acute polio as an infant, but managed to lead an active life. Shortly after his illness, the family moved to Maple Ridge. He graduated from MacLean High School in 1930, working in Vancouver in manufacturing and as a streetcar conductor. It was in Vancouver that he met his wife Agnes. When asked how the romance happened, Lyle’s response was “it was the squeak in Agnes’ shoes!” In fact, Lyle and Agnes both worked on the streetcars. They were married in the fall of 1935. Lyle was active in politics from the 1940s on, subscribing to the social credit philosophy which held that consumer purchasing power must be enhanced to match the ability of the economy to produce goods and services. In 1946 Lyle was elected Vice President of the Social Credit Association of Canada, and took the position of chairman of the Vancouver and District Social Credit Council in 1948. The next year, he became the founding President of the British Columbia Social Credit League, which consolidated the support of various “social credit” movements struggling for recognition during the administration of BC’s Liberal-Conservatives. The Social Credit League would field candidates in the 1952 provincial elections as the voice for the alternative movement. 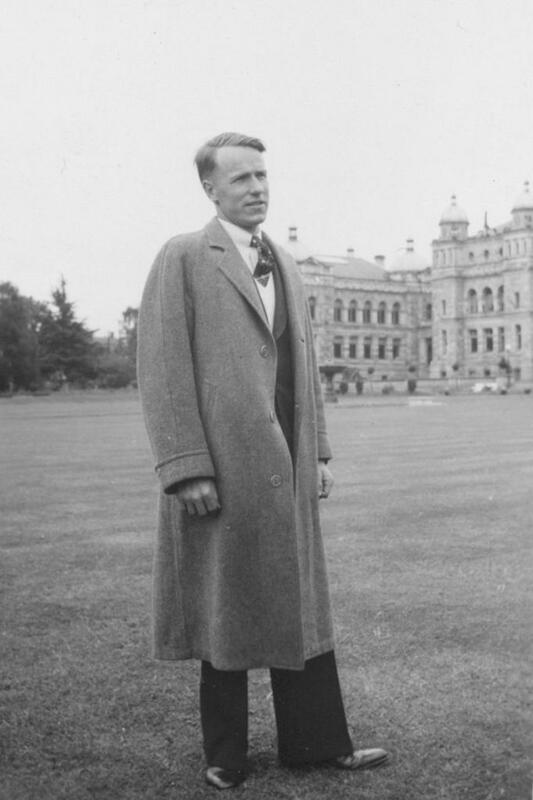 Lyle Wicks stands on the lawn of the BC legislature in Victoria, shortly after his election victory in 1952 with the Social Credit party in the Dewdney riding. Lyle ran as the Social Credit candidate for the Dewdney riding, which encompassed Maple Ridge. The previous year, he had recruited W.A.C. Bennett, who had been a member of the BC Conservative party and would become one of the few Social Credit candidates with experience in the legislature. Following the party’s surprise win, Wicks orchestrated the caucus vote that would install Bennett as premier, in which office Bennett would serve 20 years. Wicks would also serve over 20 years in Victoria, serving terms as Minister of Labour, Minister of Railways, and Minister of Commercial Transport, although losing his Dewdney seat to future NDP premier Dave Barrett in 1960. As a leader in the party, Wicks worked with Bennett to steer the party away from its roots in a specific social philosophy and towards a general conservative populism. This change would be instrumental in turning the Social Credit from a fringe movement into the political dynasty that ran BC between 1952 and 1991, with only a three-year intermission beginning in 1972 with the election of Barrett’s NDP. During his political career, Wicks played an important role in the establishment of the Albion Ferry, the development of Golden Ears Park, the establishment of the Maple Ridge and Mission Hospitals, the completion of the north shore highway connecting Agassiz to Hope and the construction of the Agassiz-Rosedale Bridge. Wicks died in February of 2004 at the age of 91.